Discussion in 'Earth Science' started by timojin, May 9, 2017. When combined with other data—sudden drops in water temperature, along with increases in dissolved oxygen and pH at the surface—the lower CO2 levels were telltale signs of bottom water upwelling and photosynthesis, Pohlman says. Pohlman and his team conclude that the same physical forces that are pushing the methane bubbles up are also pumping nutrient-rich cold waters from the sea bed to the surface, fertilizing phytoplankton blooms that soak up CO2, they write today in the Proceedings of the National Academy of Sciences. There are positive feedbacks and negative feedbacks that can exacerbate or ameliorate AGW. It has often been thought that clathrate methane releases are a strong positive feedback. This research indicates that although the released methane is still a positive feedback, the oceanic turnover caused by those releases may be a negative feedback. - and that nature's 'natural ', homeostatic mechanisms may be operating to re-establish climatic equilibrium!! There are some mechanisms that counter AGW, and some mechanisms that make it worse. Better call Al Gore, Bill Nye, and the '97% scientific consensus'!! Nope. I'll let you know when it's time for the ignoramus party to start. In fact, the study finds that in such zones, nearly 1900 times more CO2 is being absorbed than methane emitted. ... the atmospheric benefit from CO2 sequestration is about 230 times greater than the warming effect from methane emissions. Most likely not included in computer climate models? The methane from that source never has been included reliably (estimates all over the place), the extra CO2 absorption has been folded into the CO2 readings all along - the measurements used to calibrate. The aircraft-based observations uniquely show the large area in northern high latitudes where carbon dioxide amplitude increased strongly since 1960. The exact reasons for the wider seasonal swings in carbon dioxide concentration remain to be determined, say the researchers. Although plant activity can increase with warmer temperatures and higher carbon dioxideconcentrations, the change in carbon dioxide amplitude over the last 50 years is larger than expected from these effects. 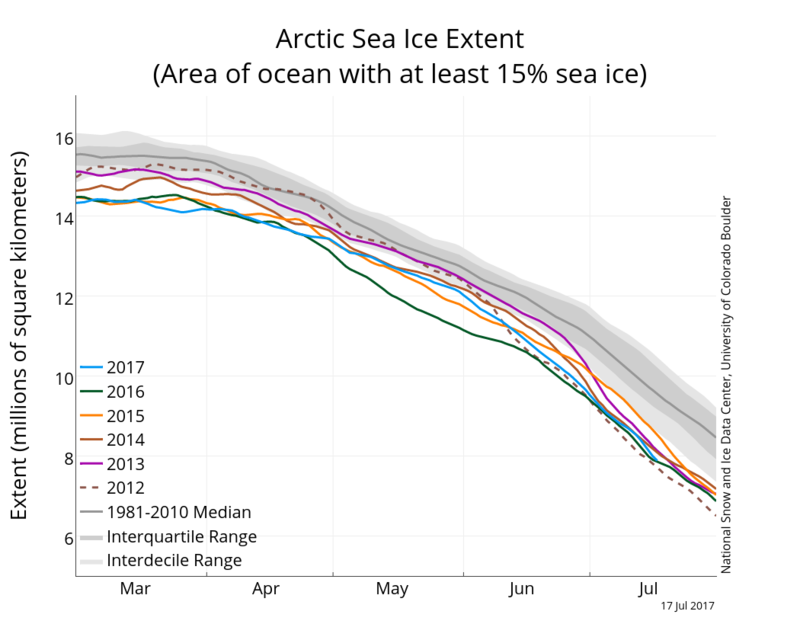 One pattern to notice: the melting curve seems to be getting steeper, the ice cover dropping more rapidly late in the summer. One handy possible: the ice is thinner these days, so the coverage area has much less ice on it - so the coverage area drops more rapidly at a given rate of melt.